The model has a sleek classic design, is presented in a round housing with a diameter of 40 mm and 1.3 mm thick stainless steel. Water Resistant – 100 meters. 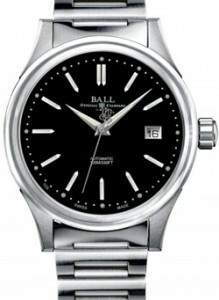 Matte black or silver dial features hour markers overlaid with microtubules with gaseous tritium. On the hour and minute hands are also found on the microtubule. Hours Fireman Classic 40mm feature Swiss automatic caliber ETA 2824-2, with the display functions, hours, minutes, seconds and date. Crash worthiness caliber – to 5,000 Gs. The novelty comes on a stainless steel bracelet or black rubber strap.